Preparations for a school concert will always be nerve-wracking for students and teachers alike. But when the big event is to be held at the Sydney Opera House and the music teacher is the determined, passionate Mrs Karen Carey, the potential for a riveting documentary is created. Mrs Carey’s Concert follows the teachers and students of Sydney’s Methodist Ladies College (MLC), an elite girls’ school with a strong music department. Although the lead-up to a concert will always be interesting, creators Bob Connolly and Sophie Raymond took a huge risk in filming almost two years of rehearsals. After all, they may have been left with hours of film with no storyline or interesting individuals. Luckily, the risk paid off, with an inspiring and insightful documentary evolving from the hours and hours of footage. Similar to his fly-on-the-wall documentaries Rats in the Ranks and Facing the Music (with his late wife Robin Anderson), Connolly as cameraman is able to infiltrate the inner workings of the music department, observing the behind the scenes action and dynamics between students and teachers. His filming involves the audience in every situation – capturing the eye-rolling of students and exasperated sighs of staff to create an authentic, believable documentary. The stressful situations are not left out either, the pressure for a student to attend the last concert rehearsal instead of a family dinner leading to tears and a lost folder sending Mrs Carey into a nervous frenzy on performance night. But while the filming and editing certainly contribute to the documentary’s success, it is also the individuals who make the film so interesting. Mrs Carey is a music teacher who dedicates herself wholly to the school’s music department. She continually encourages the students to push themselves. Her attitude is reminiscent of other teachers the audience may have met during their own schooling life – her world revolving around the music department and often blinding her to the negative attitudes of her students. Despite her tendency to push too much, Mrs Carey is truly inspiring with her big picture planning, dedication and determination. But it was students Emily and Iris who really stole the show. 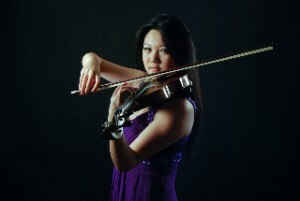 The growth that violinist Emily (pictured above) displays throughout the film is truly inspiring. Her initial reluctance to participate particularly contrasts with her final solo at the concert – dressed beautifully and reaping the rewards of hours and hours of practice. Iris, the “rebel” of the film, is just as interesting. Unlike Emily, she does not embrace the opportunity to perform. Instead, she represents the attitude of many other students who are unwilling to get involved, constantly clashing with Mrs Carey’s enthusiasm. The soundtrack of the film consists of the students’ own playing. Their talented playing immerses the audience in the world of preparation and expectation leading up to the concert. The music is carefully picked throughout the film, echoing the mood of many scenes. Having journeyed with the teachers and students, the film’s audience is able to join in the excitement and relief of both students and teachers when the performance finally takes place. The concert is a natural climax, the relief of the staff shown in the proud tears of one of the music teachers backstage. A documentary that pays tribute to music and education, this film will be loved by any passionate teacher or classical music lover.